J.R. Todd celebrates Las Vegas win. In order to win his first career NHRA Mello Yello Drag Racing Series world championship, Funny Car standout J.R. Todd knew he had to put together something special during the Mello Yello Countdown to the Championship. 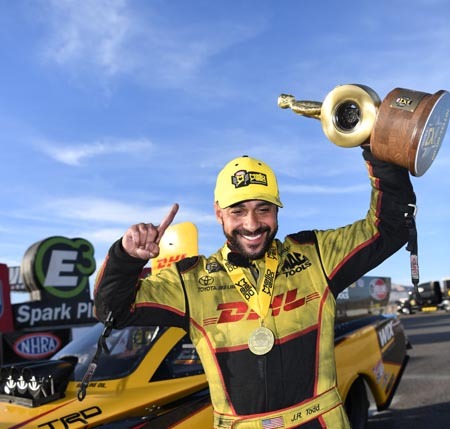 He has done that, advancing to four final rounds in the first five playoff races, but one major obstacle remains at this weekend's 54th annual Auto Club NHRA Finals at Auto Club Raceway at Pomona if Todd wants to claim a world title. His victory in Vegas - Todd's second in the playoffs - gave him a 74-point lead over defending Funny Car world champion Robert Hight heading into the final race of the season. 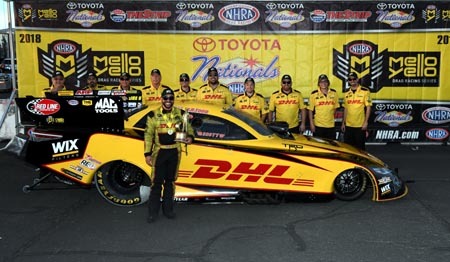 But with the point-and-a-half system in play for Pomona and up to 191 points on the line to close out the year, Todd knows he still has work to do in his 10,000-horsepower DHL Toyota Camry. "I said earlier this year if we could win four Countdown races we would have a shot at the championship," Todd said. "We haven't won four, but we've gone to four finals and that's what it takes along with getting some help. We were 50 back going into Charlotte and we were thinking we need some help now to make up some ground and we got some. Then to cap it off in Vegas with a win, it was nice to get all the points we could and take that into Pomona. Points and a half will make it interesting. We just need to maintain what we've been doing and go to the later rounds." Brittany Force (Top Fuel), Tommy Johnson Jr. (Funny Car), Bo Butner (Pro Stock) and Andrew Hines (Pro Stock Motorcycle) were last year's winners of the race that will be televised on FOX Sports 1 (FS1), including live finals coverage starting at 4:00 p.m. (ET) on Sunday, Nov. 11. 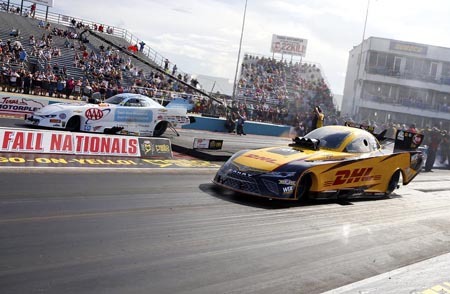 The race is the final event of the year and the Mello Yello Countdown to the Championship, and fans in Pomona are set to see another thoroughly entertaining duel in Funny Car. Hight clinched the world title a year ago at the season-finale in thrilling fashion and will need a spectacular showing this weekend in his Auto Club Chevrolet Camaro SS if he wants to be the first repeat world champion in Funny Car in 16 years. The talented veteran had the early lead after back-to-back playoff wins, including beating Todd in the final round at Dallas, but the past two races have only included one round win, putting the onus on a big performance in Pomona. "I am confident going into the Auto Club Finals," said Hight, who has 45 career Funny Car wins. "We are behind but we are going to go in there very aggressive and try to get every point we can. We can't control what J.R. Todd does unless we race him. But we'll do everything we can to make a third championship, our second in a row, happen. We've already won both AAA races this year and we need to win the third. That's going to give us the best possible chance." Ron Capps (165 points back) and Tim Wilkerson (186 points back) are still mathematically alive, but the championship will likely come down to Todd or Hight. Todd and his team, led by crew chief Jon Oberhofer and co-crew chief Todd Smith, have been on point since winning Indy, posting an incredible 16-3 record in the playoffs. With that in mind, Todd hopes to simply continue this strong run in Pomona, hopeful he will end the weekend with his first world championship. "If you ask me, you don't change a thing," said Todd, who has five wins in 2018. "I'm not going to change the way I drive and I don't think that Jon O. or Todd are going to change the way they are running the car. We just need to keep making consistent runs. Step one is getting qualified there in Pomona and try to put it in the top half. Then we take it one round at a time. It's not over yet. We still have a lot of work to do in Pomona. We just need to keep after it and not let up." On the strength of five straight wins in the Countdown to the Championship, Steve Torrence claimed the Top Fuel world title in Vegas, and he'll look to sweep the playoffs in Pomona. J.R. Todd and crew celebrate Las Vegas win. Second-year Pro Stock star Tanner Gray has seven wins in 2018, including two in the playoffs, and currently holds a 140-point lead over Jeg Coughlin Jr. It's a tight race in Pro Stock Motorcycle, with two-time world champ Matt Smith keeping a slim four-point advantage on defending world champ Eddie Krawiec. LE Tonglet is 61 points back. As always, fans can interact with their favorite drivers as they're granted an exclusive pit pass to the most powerful and sensory-filled motorsports attraction on the planet. This unique opportunity gives fans direct access to the teams, allowing them to see firsthand the highly-skilled mechanics service their hot rods between rounds, and get autographs from their favorite NHRA drivers.